Here’s a Fun Thanksgiving Craft That’s Sure to Gobble Up Attention! The turkey is basting, the pies are cooling, and the guests are arriving. While the food takes center stage at the Thanksgiving dinner table, fall and holiday décor add to the ambience of the meal. This year, why not spruce things up with festive paper turkeys? This Thanksgiving craft is fun and simple to make with just a few items from your local craft supply store. While the photo above depicts plain paper, you can use coordinating printed paper for a craftier look! Once you have all of your supplies, you’re ready to get started! Step 1: Starting with the red piece of paper (purple in photo), line up the edge of your ruler with the side of the paper. If you are using rectangular paper, start on a long side. Take your versatile Scrigit Scraper and run the rounded tip of the angled end along the entire length of the ruler. You should now have a 1” scored strip. Fold it back over itself on the opposite side of the paper, and run the flat end of the Scrigit Scraper along the fold a couple of times. Tear off or cut off this strip and set aside. Step 2: Repeat Step 1 for the orange piece of paper (red in photo), but score 2 strips and remove. Set aside one strip for the turkey claws. Step 3: Repeat Step 1 for the yellow piece of paper, but score 3 strips and remove. Set aside one strip for the beak. Step 4: For this Thanksgiving craft, you are now going to make the “fan” body of the turkey. 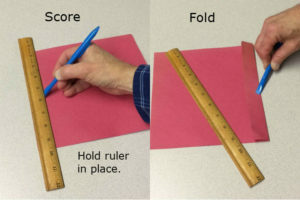 With the remainder of the red sheet of paper, line up the ruler with the edge of the short side of the paper at a right angle to the previous scoring, but this time only score on one side of the paper and do not tear anything off. Repeat the ruler process along the entire length of paper, creating 1” score marks. Then, starting with the leftmost score, fold the paper inward and run the Scrigit Scraper alongside the fold. Turn the paper over and fold on the next scored line, again running the Scrigit Scraper on the fold. Turn the paper back again and repeat this process to create an accordion-style fold pattern in your paper. Step 5: Repeat Step 4 for the remainder of the orange and yellow sheets of paper. Step 6: For each color, fold the entire accordion into a strip. Fold the strip in half end-to-end. Take the center-most edges and tape them together to form a fan shape. Step 7: Lay the folded red strip down with the fold towards you and the taped center edges on the left. Place the folded orange accordion (with the taped edges on the left) to the right of and touching the red accordion. Place the shortest yellow accordion (with the taped edges on the left) to the right of and touching the orange one. With the bottoms of the strips lined up, tape the folded strips together on both sides. Then open the fan. The body is now complete. Set aside. Step 8: Take the dark brown card stock and fold in half (if using rectangular paper, fold width-wise). Score the fold and refold several times and tear. Taking one half, create a 2” strip using the method from Step 1. Do not fold down the center of this strip. Once created, set it aside. With the other half, draw a fat bowling pin (use the image above as a reference), approximately 3” tall. Cut out the shape. Step 9: Using the yellow strip of paper, draw and cut out a small piece for the beak as in the photo. Use the orange strip to draw and cut out claws, and the red strip to draw and cut out a wattle, as in the photo above. Step 10: Using your white and black paint pens, draw the eyes onto the body. (If using googly eyes, glue them). Glue the wattle to the underside of the beak, and then glue the beak to the body with the taped edges of the body facing backwards. Glue the claws to the body. Glue the body to the front of the accordion, applying glue lightly to the edges of the yellow folds. Step 11: Your turkey should stand up on its own. If it doesn’t, glue or tape the remaining brown strip of card stock perpendicular to the bottom of the turkey. Trim the excess of the strip behind the turkey. Step 12: Enjoy your creative Thanksgiving craft! Happy Thanksgiving! 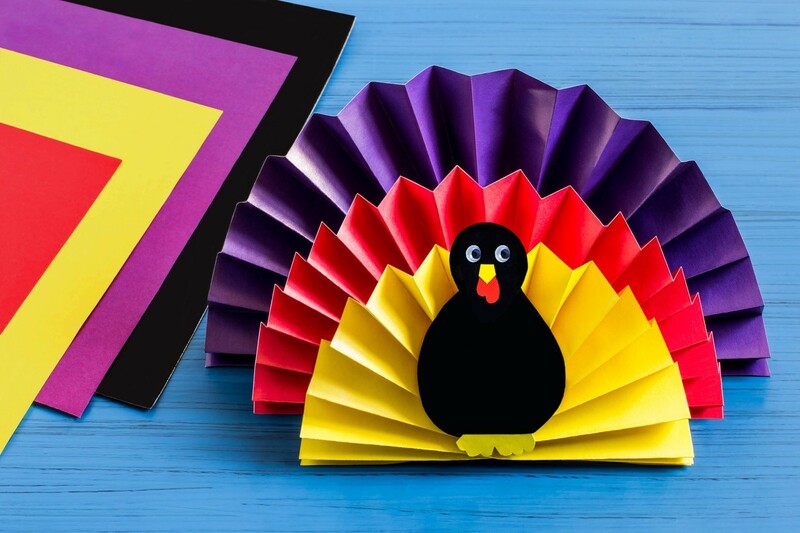 Here are some more Thanksgiving crafts for kids.